As shareholders at Google's annual convention were counting their well earned dividends, America's premier billboard improvement corporation, Billboard Liberation Front, assisted the Austrian arts collective monochrom in a monumental advertising coup designed to celebrate Google's online partnership with the Peoples Republic of China. China's heroic effort to protect their enormous internet market (162 million!) from an overload of useless information includes a moratorium on abrasive, ugly, and thoroughly misleading concepts such as truth. China's Internet "Cultural Revolution" is made possible through support from America's most leviathanesque behemoth, Google Inc. 'Don't be evil' says Google's PR department! 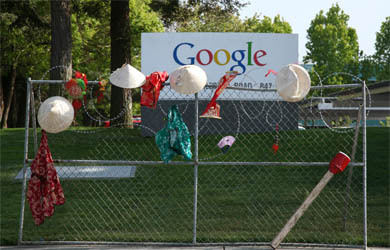 During Dr. Eric Schmidt's keynote address on China, BLF and monochrom agents worked feverishly to improve signs on Google's campus. 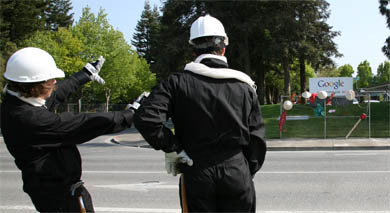 monochrom came to the USA to promote a singular concept called Sculpture Mobs. "No one is safe from public sculptures, those endless atrocities!" explained Johannes Grenzfurthner, "All of them labeled 'art in public space'. Unchallenging hunks of aesthetic metal in business parks, roundabouts, in shopping malls! It is time to create DIY public art! Get your hammers! Get your welding equipment!" 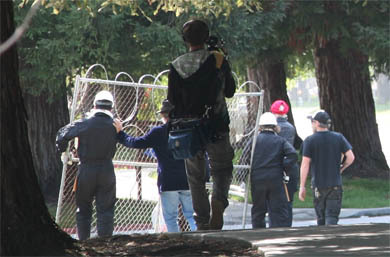 At the Maker Faire in San Mateo earlier this month, Johannes and accomplice Daniel Fabry trained attendees to erect public sculptures in a simulated Wal-Mart parking lot in just 5 minutes before "security" was called. Google and the PRC proved to be the ideal test case clients for this new advertising improvement technique. Said Grenzfurthner, "We needed to maintain a low standard of political metaphor to give American citizens a chance to understand it. From an aesthetic perspective, The Great Firewall is radically mediocre. In the end, China's stoic indifference to Western art insanity is quite impressive." "The truth is a bummer," agreed BLF CEO Jack Napier, "it's confusing, and they're damn lucky Google has such a lovingly orchestrated filter to shelter them from it"
The BLF (http://billboardliberation.com) has been improving outdoor advertising since 1977. Prior campaigns have included work for Exxon, R.J. Reynolds, General Motors, Revlon and Apple Computers. monochrom (http://monochrom.at/english) is an Austrian based worldwide collective dealing with technology, art, context hacking and philosophy since 1993. Some of them are afraid of skin cancer.